There’s a revolution going on in this country–born largely in California–that has nothing to do with music, politics, or some insanely great gadget. It’s a revolution in beer, a beverage that’s existed for over 5,000 years and continues to be reinvented to this day. Large breweries run by multinational corporations producing unoriginal, ﬂ at tasting yellow lagers are dramatically losing market share to a growing ﬂ eet of smaller independent companies. These breweries are concocting a wide variety of rich, ﬂ avorful, and unique brews. Increasingly, beer drinkers are enjoying the endless ﬂ avor combinations and possibilities of microbrews, and becoming more aware about where their beer comes from. California breweries are major pioneers of this movement. Unlike most businesses with tightly protected company secrets, many breweries happily throw open their doors to let you experience their sights, sounds, and tastes. Check out these four highly recommended tours. Mark Carpenter. Photo courtesy of Anchor Brewing. Go to Anchor Brewing and you’ll see a piece of San Francisco history. The brewery is housed in a four story Depression-era brick building in San Francisco’s Potrero Hill neighborhood. Visitors meet in the brewery’s taproom, with its classic carved wooden interior and old brewery photographs–including Janis Joplin happily enjoying an Anchor Steam. The tour starts with the tumultuous history of Anchor Brewing. It’s one of the oldest breweries in the United States, dating back to the Gold Rush-era in San Francisco. It survived the 1906 Earthquake and Prohibition, but nearly went bankrupt in 1965 before Fritz Maytag, a recent Stanford graduate from a Midwestern family of prominent dairy farmers (think “Maytag Blue Cheese”) learned of the imminent demise of his favorite beer and purchased 51% of the business. The brewery offers two tours a day on Weekdays. 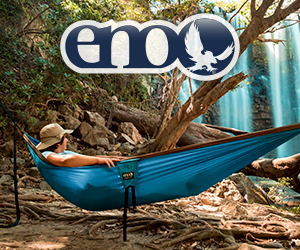 Tour reservations are taken up to six months in advance and dates ﬁ ll up quickly, often weeks in advance. Call 415-863-8350 for more information and to make reservations. Admission is free. Tiny, rustic Booneville, with its 1,000 residents, looks like a typical small town, but is like no place on earth. It’s home to an eclectic group of artists and some of the ﬁ nest Pinot Noir growing land in all of California. It’s also the source of Boontling, a quirky, folk language of the region that sprang up in the late 1800’s. Boontling is largely defunct, save for a few dedicated local practitioners keeping the language alive. This includes Anderson Valley Brewing, located on the Southern edge of town, which names their beers after Boontling phrases and place names. Anderson Valley’s current brewery went online in 2000 after outgrowing its previous location in central Booneville. The open 30-acre brewery grounds also include a disc golf course, a taproom, a ﬁ eld of hops growing up a series of a vertical support lines, and eight goats used to “mow” the grounds. 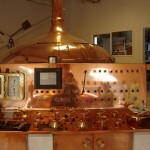 The Anderson Valley Brewery tour meets in the taproom and proceeds into the brew house, where the ﬁ rst thing you’ll see are three gleaming copper brew kettles recovered from a defunct German brewery. 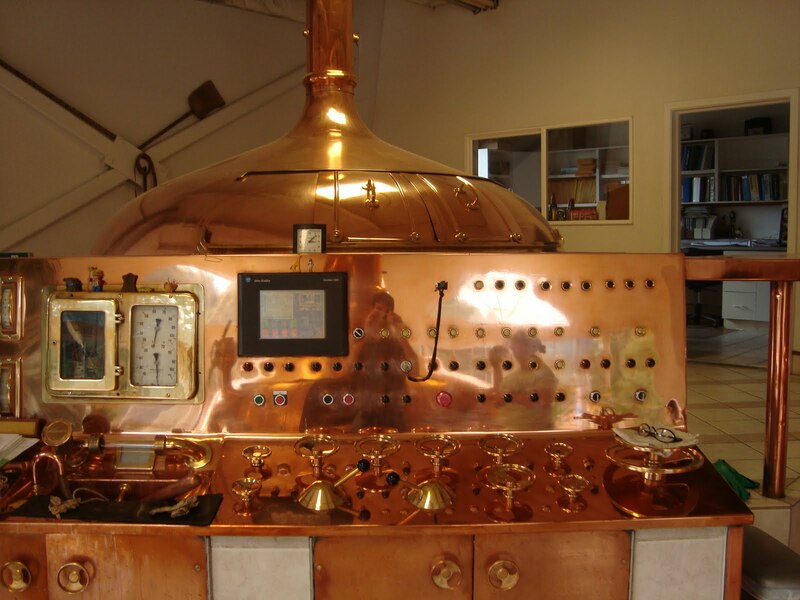 There’s an equally impressive looking old world control panel that looks like something Captain Nemo used to pilot the Nautilus, but if you look carefully, a smaller, more modern electronic controller is actually used to control the brewing equipment. “We like to educate people on the brewing process,” explains Rebecah Toohey, Anderson Valley’s taproom Manager. 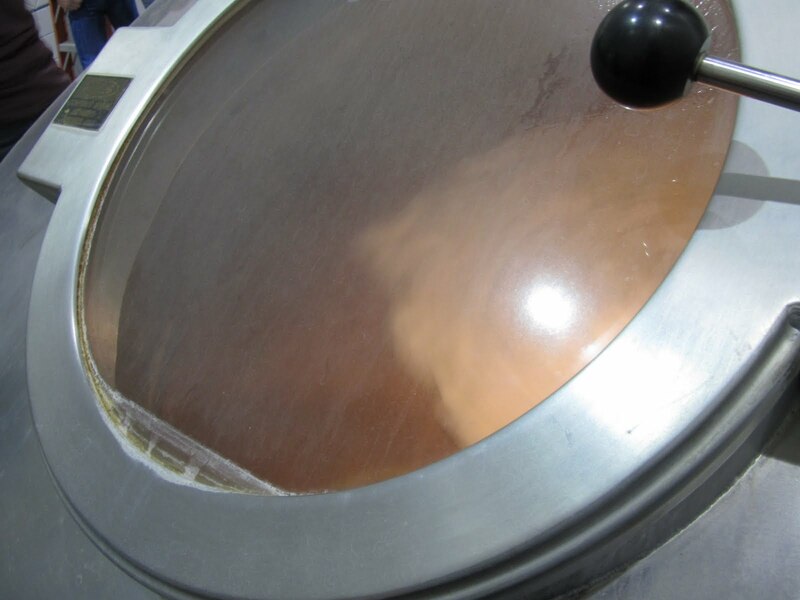 “During the tour, we go over the history of the brewery, as well as each of the steps we take to brew our beer.” This includes a trip to the hop freezer. There’s nothing more stimulating then walking into the cold air of the hop freezer and deeply inhaling all the fresh, piny hops Anderson Valley uses for beers such as their Hop Ottin’ IPA and Poleeko Pale Ale. Visitors also get to go up on the brewery roof and see the solar panels which generate about 40% of the brewery’s electricity, while learning about the many other environmental initiatives that are part of Anderson Valley’s commitment to its unique region. Tours start Daily at 1:30 and 3:00 p.m., except between January and March, when they only run Thursday-Monday. The tour costs $5, and include two beer samples from the taproom, and a $5 coupon for any purchase over $10 in the brewery gift shop. Call (707) 895-BEER for more information. Lagunitas is ﬁrst and foremost about having a good time. And everyone working at Lagunitas seems to be doing just that, as all the staff at the Lagunitas Taproom and Beer Sanctuary has a genuine, infectious enthusiasm for the place. The Taproom and Beer Sanctuary serves food and often features live music. Tour guides announce the start of each tour by clanging a bell and waving a small, crudely written cardboard sign above their head. Anyone who wants to join simply follows them out into the brewery. Brewery tours typically have the aura of a high school science ﬁ eld trip, but as tour guide Ryan Tamborski tells the story of Lagunitas founder Tony Magee, he works the room like a stand-up comic. “In the early days, there was a problem when Tony Magee ﬂ ushed yeast into the community septic tank. Does anyone know what you get when you ﬂush yeast into a septic tank? Coors Light!” Indeed, there’s plenty of entertaining stories behind many of Lagunitas beers, and most involve either marijuana or owner Tony Magee thumbing his nose at various authorities. The tour guides are master storytellers, and the Lagunitas Brewery tour is the most entertaining hour I’ve ever spent at a brewery. But behind the goofy humor, one also witnesses relentless capitalism. Lagunitas is one of the fastest growing breweries in the United States, available all over the country, and commanding high prices on the black market overseas. Ryan happily showed off the shiny state-of-the-art equipment Lagunitas recently invested in to meet this exploding demand, as well as sharing their plans to open a second brewery in Chicago at the end of this year. Tours happen Mondays and Tuesdays at 3:00 p.m., Wednesdays at 3:00 and 5:00 p.m., and Saturdays at 1:00, 3:00 and 5:00 p.m. Call 707-778-8776 for more information. Sierra Nevada, in Chico, is where to go to learn about beer. 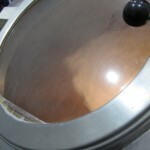 The tour takes over an hour and carefully goes over every step of the brewing process. It starts in the mill room, which prepares the malted barley for brewing. Next, in the brew house, a large room with impressive copper brewing kettles, visitors can peer inside to see the mash through glass windows. You can actually sample a taste of wort, the liquid full of extracted sugars from malted barley, used in Sierra Nevada Pale Ale. There is also an invigorating trip to the Sierra Nevada hop freezer room as well as overhead views of the bottling and canning lines. In addition to brewing, visitors learn plenty about Sierra Nevada’s array of environmental practices. Climbing up to a catwalk above the brewery, you’ll look down on no fewer than 10,763 solar panels adorning the roof. Guests also discover that hydrogen fuel cells provide approximately 50% of the brewery’s electricity, and that Sierra Nevada actually paid to extend a railroad line a few miles so that rail cars could roll right up to the brewery, eliminating the CO2 emissions from trucks transporting supplies. For those more interested in Sierra Nevada’s environmentally sustainable practices, the brewery hosts Sustainable Tours on Fridays, Saturdays, and Sundays to focus on Sierra Nevada’s environmental initiatives. Weather permitting, there is a beer tasting in an outside garden at the end of the tour. The tasting consists of four samples. To make tour reservations at the Sierra Nevada Brewery go to tours@sierranevada.com, or contact the Tour Desk: 530-899-4776 If you want to get to visit your local brewery, contact them to see what they have to offer. While most breweries do not have organized tours as de-scribed here, many have taprooms, open houses, or other events on brewery premises. If you want to get to visit your local brewery, contact them to see what they have to offer. While most breweries do not have organized tours as de-scribed here, many have taprooms, open houses, or other events on brewery premises.